Teachers spend a significant amount of time with students every day, and are well qualified to notice a change in behavior. The struggle for some teachers is identifying when a student’s behavior change might be the result of a destructive eating patterns, and if so, what the best course of action to take is. Every student’s situation is unique. The more you understand eating disorders, the more assistance you can offer a student. Are certain students more likely to develop an eating disorder? Eating disorders can affect anyone including men and women of all ages, races and body types. However, certain individuals are more prone to developing eating disorders, especially in a school setting. One of the student groups prone to this disorder is associated with bullying. Young victims of bullying are extremely vulnerable to eating disorders, especially if the bullying is related to weight or body image. Weight-based bullying can cause depression and anxiety, which can lead a student to take more drastic measures and develop dangerous behaviors. Another group particularly vulnerable to eating disorders is student athletes. In most cases, female athletes are more likely to develop eating disorders, especially if the athlete competes in aesthetic sports such as cheerleading, dance, or swimming and diving. Male athletes, especially those who compete in weight-class sports such as wrestling or weight lifting, are also prone to develop eating disorders. While not all student athletes or victims of bullying will develop an eating disorder, students who fall under either umbrella – and demonstrate the eating disorder signs – should be reached out to by teachers sooner rather than later. Early detection of an eating disorder can increase the chances that a student successfully recovers from treatment. The sooner a student is able to get the help that he or she desperately needs, the sooner the student can begin recovery and get back on the road to living a happy and body-positive life. Teachers play a monumental role in initiating a student’s recovery by recognizing the various signs of an eating disorder before the side effects have spiraled out of control. The signs of eating disorders don’t always manifest themselves in clear or obvious ways. Individuals who have an eating disorder often try to keep the condition hidden and avoid drawing attention. 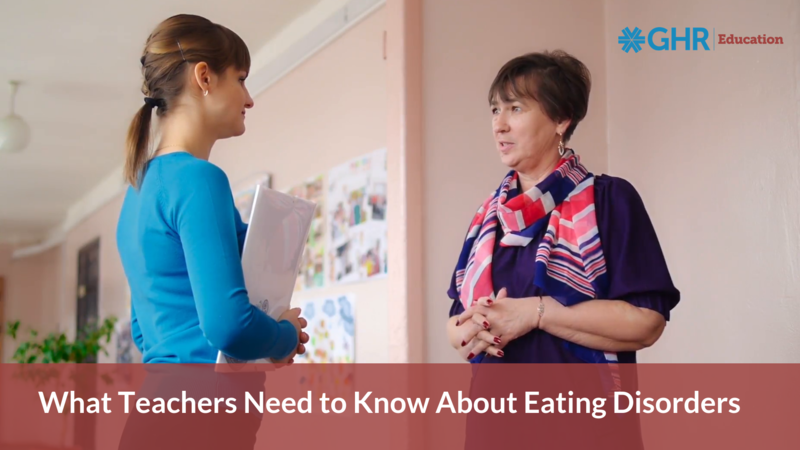 Therefore, an educator can find it difficult to confirm whether or not a student is actually suffering from an eating disorder and may be hesitant to approach the student about any concerns. If you suspect a student may be suffering from an eating disorder, there are a few things teachers can do to help the student recognize their problem and begin recovering. The first step is creating a safe space to speak to a student about your concerns. Asking to speak with a student after class, when no other students are around, can offer a calm environment where the student feels free to open up to a teacher who expresses concern. Teachers can also be supportive by creating student assistance programs where students are able to learn more about eating disorders and learn methods for coping with body image issues. These programs help reduce the stigma surrounding eating disorders and encourage students who are suffering from such disorders to seek out help. The most important thing to remember no matter which approach you take: Show the student plenty of support. If the student ever feels judged or disapproved of, they are more likely to reject help and fall further into isolation. Teachers must create a safe environment where students can begin to face their challenges. By knowing the signs of eating disorders, and having a few tools in place to assist students who may be suffering, teachers can help save a student’s life.